I've just spent a few hours researching old singer machines and tracking down the dates of the serial numbers of our latest machines. This site is good; the pdf links on the right contain the models as well as the dates, so I was able to identify a couple of unmarked machines in our collection. I'm going to have to make a file card for each machine so I remember what it is and where we got it. As soon as I bring a machine home I give it a good oiling, replace the needle and clean off the dirt. Some of these machines are filthy when we get them. At an antique shop last week Mereth dredged a 99k out from a sea of disgusting debris, and the dealer was so appalled at it's appearance that she got it for $10. It's covered in spider webs and bodies, plus pet hair and years worth of dirt. I'm going to have to be brave to tackle that one. The domed cover will clean up well though, so it was worth it for that alone. Just to be safe, I always use a ShockSafe powerboard to plug these old machines in; their wiring can be a bit erratic, and I don't want them blowing fuses or worse. Once the machine is clean I tweak the stitching until it's sewing nicely, then go through my collection of feet from lots of different machines, trying to find one that is a perfect 1/4" seam. I bought a 1/4" foot for my Featherweight here, and that has proved just right for several of the 99k machines. If I can't find a foot that's perfect, I have lots of these seam guides, so there can be one for each machine if I want. I also acquired this beauty of a 201K, in a very sturdy table. She must have been well looked after, because she sewed the most perfect stitch without me having to change a thing. I can't wait to sew some piecework on her. The feed dogs drop down too, so I could free-motion quilt on this if I wanted. We're lucky that only one machine, the $10 99k, has refused to sew; all the others have been coaxed into producing impeccable 1/4" seams. The old Singers are fantastic machines. What are we going to do with all these machines? Some of our beginner patchwork students don't own a sewing machine, so they can borrow one of ours to use while they learn. 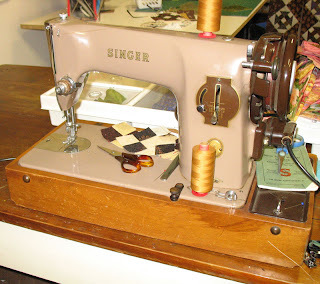 If they decide they don't like machine sewing they haven't gone to all the expense of buying a machine they won't use. And meanwhile Mereth and I have 18 machines to choose from when it comes time to piece our own quilts. And just to prove that I still do piece, my Jacks On Six top is almost finished. 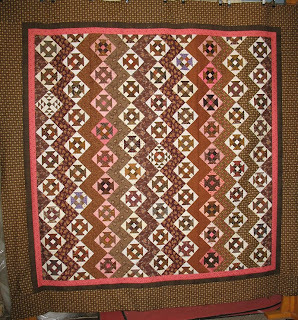 It needs one final border at the bottom, but because the material was cut crookedly in the shop I couldn't get the required number of strips from it. So it means yet another trip back to the quilt shop, but that's no hardship. We are planning an excursion with friends, so I'll just wait patiently for this one to be completed. After a lot of effort and indecision I have the Mini Monkey Wrench in one piece. It seemed to take forever. 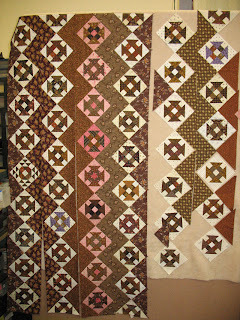 When it came time to choose the borders I kept picking fabrics that I didn't have enough of, which was frustrating. These are quite fine, even if they weren't my first choices, and I'm just glad to get the whole thing finished. I have a huge basket of leftovers, so I may have to make a miniature version, or just sew all the bits into crumb blocks. I'm a bit sick of them by now. It's Patchwork Group tomorrow, so I will need another project now. Goody! 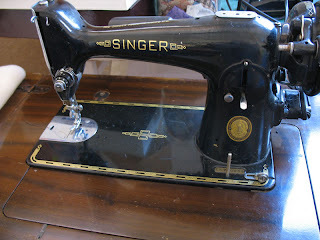 We went off to Adelaide yesterday to pick up a couple of sewing machines to add to the collection. 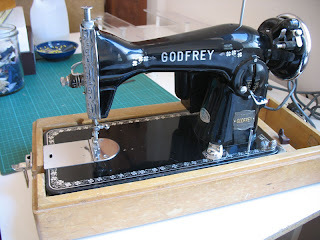 There was this one, in a nice cabinet, a cute 99k that luckily came with a complete manual, and as a bonus we found this Godfrey machine for sale as well. We couldn't leave it behind, just look at those pretty decals, and it's in rather nice condition. 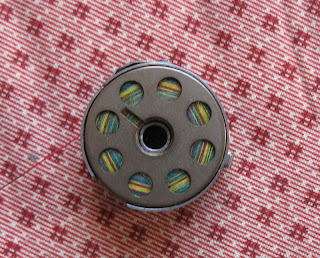 Missing it's bobbin case, but we will find one somewhere. It's just a rebadged Singer, shouldn't be too hard to track down spare parts. During the week we went to a local antique shop and the owner fished this Horn sewing cabinet out of her shed for us. It's in fantastic, mint conditon with a gas lifter and everything, for the price of three or four magazines. 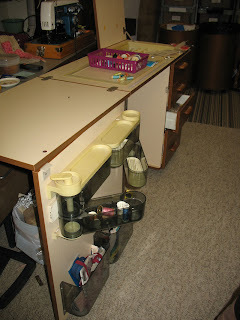 Plus the drawers were stuffed full of cottons, pins, zippers and bias tape. We had so much fun sorting it all out. I think my 6500 will live in this, as I'm using the old 201 for most of my piecing. I can leave the 6500 set up with the walking foot for any quilting I want to do, and for binding. 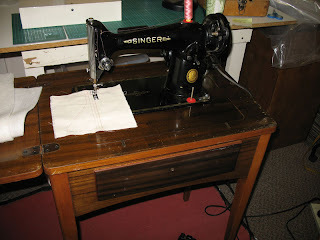 We went for a drive the other day, on the hunt for a suitable table for my sewing room. At an antique shop in a nearby town we spent a pleasant hour combing through all the knick-knacks, books, china and saucepans, collecting a few things we had to have. When we went to pay for them the owner of the shop remarked how strange it was that everything we had chosen belonged to one woman. 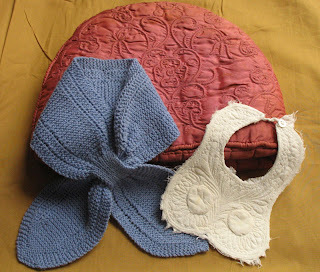 A 75 year old spinster is in the process of downsizing, and there were many of her things displayed in the shop, including her entire baby layette and several exquisite little dresses. She came from a family of magnificent seamstresses and knitters, that's for sure. I found two quilted items that had to come home with me. 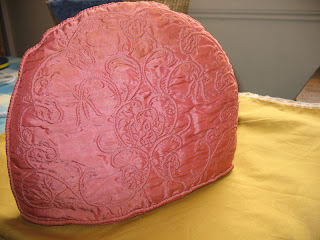 The tea cosy is hand stitched corded quilting, with a machine quilted lining. It has a few stains, but it's in fine shape so I will carefully wash it next summer when the thick padding will dry quickly. 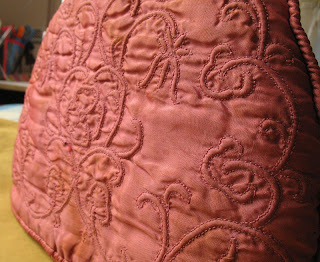 The pattern is formed with two lines of backstitching to form a channel, with pink cord threaded in. The backing is very coarse cream cloth, I can just see a glimpse of it through a small hole. 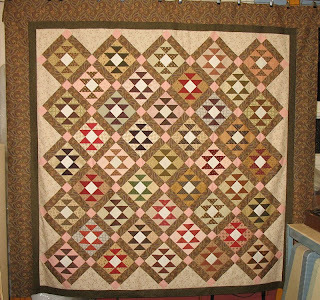 The lining inside is pink cotton quilted in a plain grid. This baby bib is intruiging, as it's machine quilted in a very dense pattern, with the tiniest of stitches. It's a very early eample of machine quilting, and it's so beautifully and skillfully done that it's obviously not a learning piece; this was made by someone who was an expert at machine quilting. And it was used to bits, as the ragged edges show. I may frame this, it's so unusual. I did get my table, but we'll have to go back next week to pick it up; I think a few more of that lady's treasures might join our collections; it will be nice to keep them together. 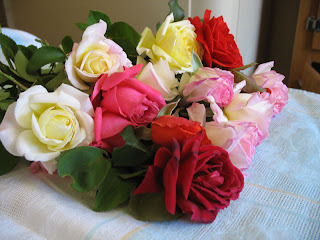 We picked this bunch of roses early this morning, the garden at Mereth's place is putting on one last show. I'm enjoying the beginnings of the cool weather and grateful for a gradual transition to winter; it will be interesting to see how I handle my first real cold spell in 22 years. My Janome 6500 has developed a hacking cough and rattle, and will have to be taken in for a service. In the meantime I trialed every other machine I own, trying to find which one was the best replacement. 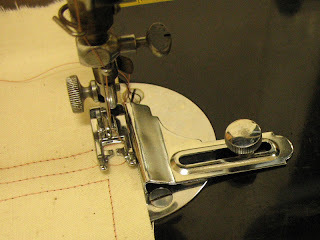 The Featherweight was nice, but ultimately this 201P of Mum's sews the best 1/4" seam. This is the machine that Mum bought when she found out she was having two babies instead of one. 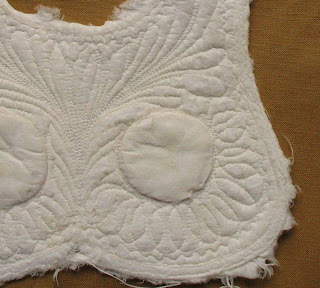 When we were in high school we sewed all our clothes on it, and Mum used it until she was in her seventies. It still runs like a dream. I'm working on the Churn Dash blocks, but they seem to be going very slowly. I've cut all the triangles for the zigzag setting, which busted 2.25m of stash. 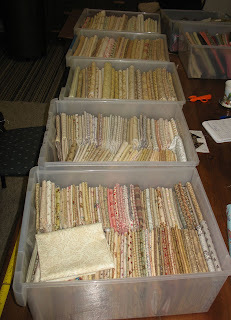 My browns are being depleted, but that is good because I have quite a lot of these particular fabrics. It's good to be making a dent in them. My DS has had an exciting week. 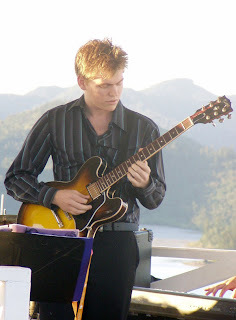 He is studying at the Mackay Conservatorium of Music; he is part of a jazz band and they had a gig on Hamilton Island. 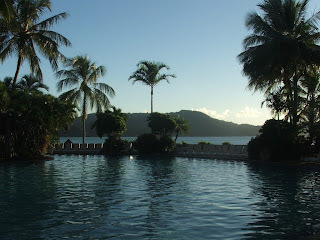 The pictures he sent are fantastic, what a beautiful setting. He's playing at the Entertainment Centre tonight, and at the Mayor's Ball next week. I'm rather proud of him, and he even remembered to send me a message for Mothers Day! 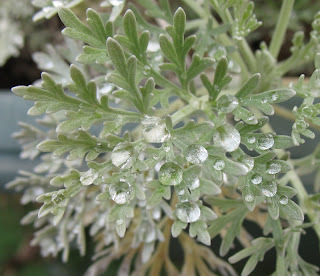 There has been welcome rain in the last few days, and nice cool autumn weather. The plants are having a last fling of flowers before the winter arrives, and the garden at Mereth's is full of roses and gerberas. It's a lovely time of year. 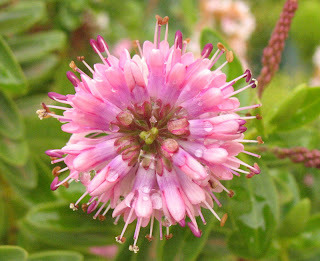 My Hebe is flowering again, I love that little heart shape in the centre, and the rain drops on the petals. 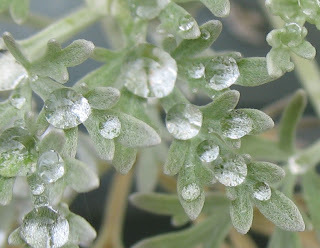 The next two photos are raindrops caught and held by the furry leaves of Wormwood; the plant looked like a little Christmas tree decked with diamonds in the early morning sun. Our brother and sister-in-law are going home in a few days time, so we are spending a lot of time together. On the weekend we went to visit our other brother and family, for a barbecue lunch. I got to eat kangaroo steaks for the first time, which was.....interesting; I'd definitely have it again. It has to be eaten quite rare, which suits me down to the ground, but I felt a bit guilty eating our national icon. I got over it tho. Isn't this fruit absolutely gorgeous? 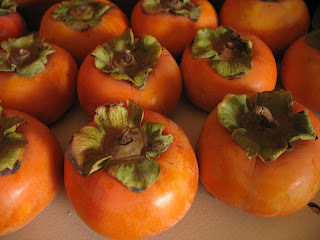 They are persimmon, and they look and feel as if they are made out of porcelain. There's something unreal about them. The flavour is amazing, like melon and apple and apricot all rolled into one, absolutely delicious. I must try and get a tree next time we go to a plant nursery, I'd love to be able to pick them from my own backyard. These came from my SIL's father, who has a loaded tree, lucky man. We worked hard on a customer quilt this week, it's a present for the customer's soon-to-be 80 year old Mum. 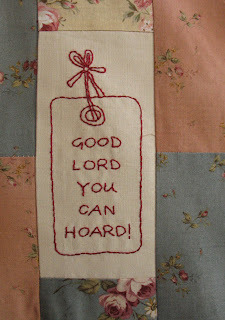 There are comments embroidered all over the quilt, and we got such a laugh reading some of them. I can really identify with this one! When they present this quilt at the birthday lunch I hope they have the tissues ready, the birthday girl is sure to cry when she reads all the messages of love. There are times when it's great to be a quilter.